A fuel cell is an electrochemical energy conversion device that converts hydrogen and oxygen into water, producing electricity and heat in the process. Instead of recharging electricity, fuel cells use hydrogen and oxygen! The fuel cell will compete with many other types of energy conversion devices, including the gas turbine in the city's power plant, the gasoline engine in your car and the battery in your laptop. A fuel cell produces electricity. 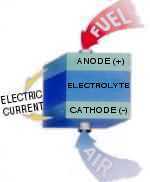 Most fuel cells do this using the chemical reaction between hydrogen and oxygen. Normally hydrogen burns, reacting with oxygen from the air, producing water, heat and light. To get a better undertstanding of what I'm trying to say go here Click here!